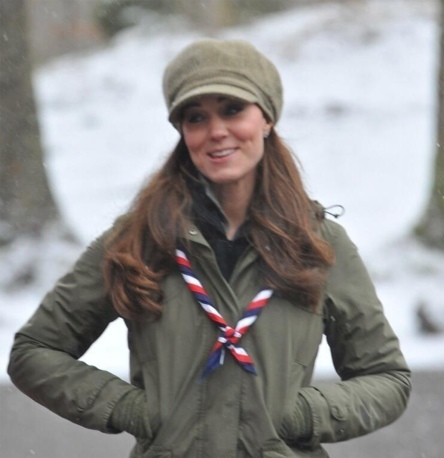 Kate dressed warmly for today’s volunteer training with the UK Scouts, a wise decision when one looks at the snowy weather. 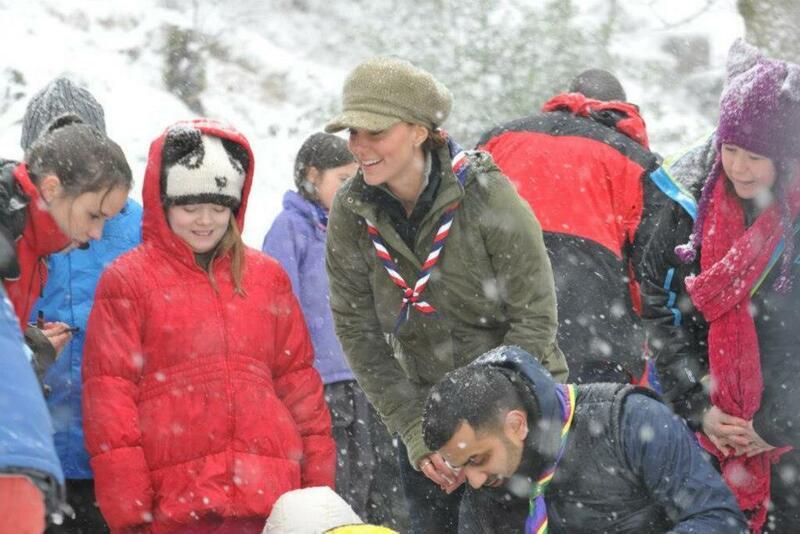 Kate joined 24 other volunteers at the Great Tower Scout Camp, one of nine Scout Activity Centres in the UK. It is located in Britain’s largest National Park, situated in the gorgeous Lake District on Cumbria. Readers may recall that Kate has long been involved with Scouting. This is not one of Kate’s Patronages, she is a volunteer. The Queen is actually Royal Patron, and HM’s cousin, the Duke of Kent, serves as President of the UK Scouting Association. Some readers may have seen news this week that the Duke suffered a stroke and has been hospitalized since Monday. It is said to be a ‘mild stroke’ and the Duke’s prognosis very good. “Simon Carter, assistant director of The Scout Association, said: ‘The Duchess works with eight to 10-year-olds, she’s learned how to do stuff when she goes to cubs on Wednesday evenings. Kate, who is naturally sporty, enjoys the outdoor life and has enthused about her role supervising Cubs aged 8 to 10 in Anglesey. Last July she hosted a barbecue for her local pack near her farmhouse in Anglesey, flipping burgers and teaching the children how to gut fish. Here we see Kate and other adult volunteers relaxing for a moment before getting to work. 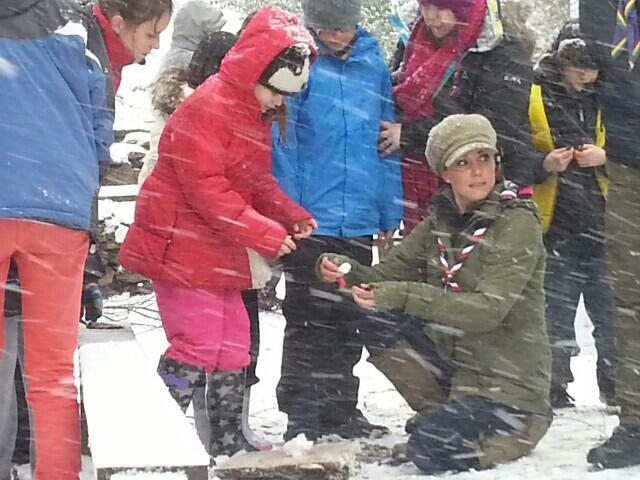 Everyone was bundled up warmly, below we see Kate working with Beaver Scouts and Cub Scouts on fire lighting techniques. After the fire training it was time to make “dampers” or “twists,” essentially unleavened bread cooked over an open fire on a stick. In this photo from Hannah Upton of the Westmorland Gazette we see the dough making about to commence. Kate discarded her fingerless gloves and mixed in sticky flour while still wearing her priceless engagement ring before making twists in the snow. “Oh, that’s brilliant,” said a fellow volunteer, as the Duchess giggled while wrestling with the bread and laughing at others’ attempts. “Would you like to try it?” She asked one instructor. “You are more than welcome to try mine,” she told another. When they didn’t take her up on the offer, she tried the bread herself. “Oh, it’s actually not bad, if you were really desperately hungry. It’s quite sugary,” she said, laughing. You can see how windy it was at times in this picture from Paul Berentzen of the North-West Evening Mail, the snow is almost at a 45 degree angle. Rhiannon Clifford-Powell, aged 10, was one of the Scouts lucky enough to meet the Duchess. She said: “I was really excited when I found out Kate was coming and I was bursting to tell everyone but I had to keep it a secret. After a lunch break it was time to move to other activities. 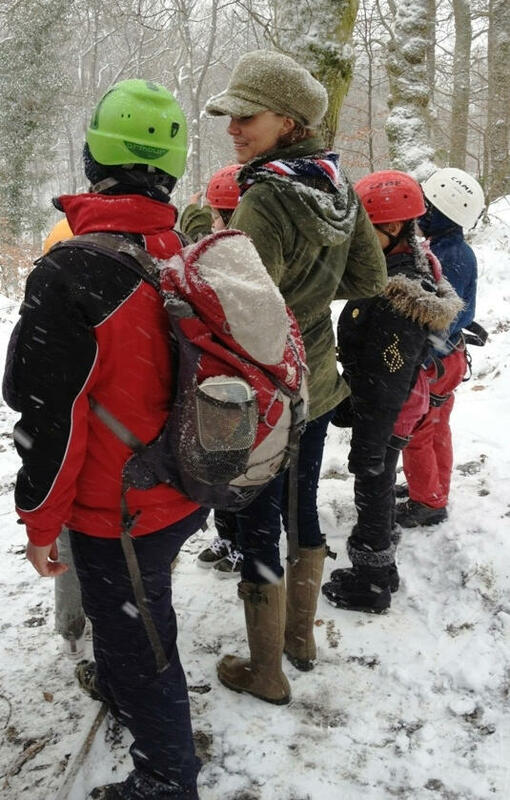 Helping young Scouts learn to climb some of the many (and very tall) coniferous trees at the Camp was a challenge in the snowy, windy weather. The Duchess stayed firmly on the ground for this exercise. We currently have 35,000 young people across the UK who can’t join up because we don’t have enough adult volunteer leaders. The reason we value the Duchess’s support is that even though she is very busy she helps out when she can. Mid-afternoon the Scouts and Volunteers gathered for one big photo. Kate wore many familiar pieces today, as well as some we haven’t previously seen. Readers will recognize her Le Chameau Vierzonord wellies. 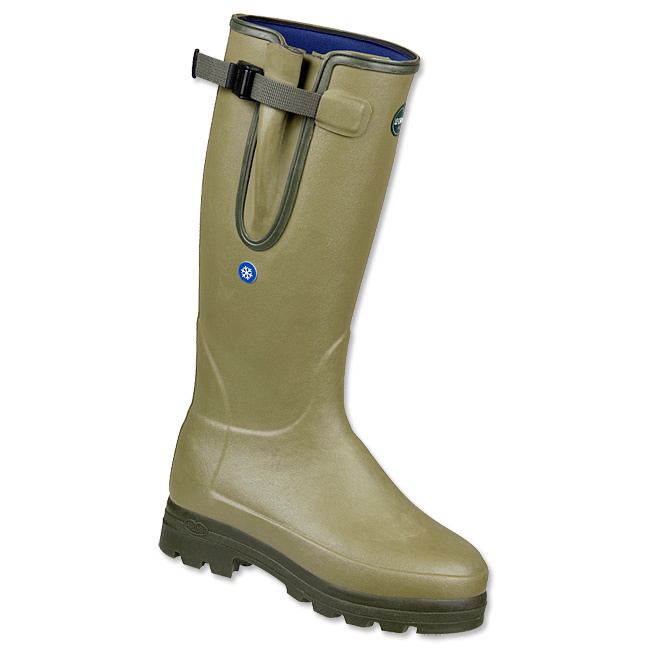 This is one of the brand’s warmest boots, lined in 2mm thick neoprene. The boots remain in stock in some sizes at Orvis US, across the pond our friends at Philip Morris have a solid size selection. 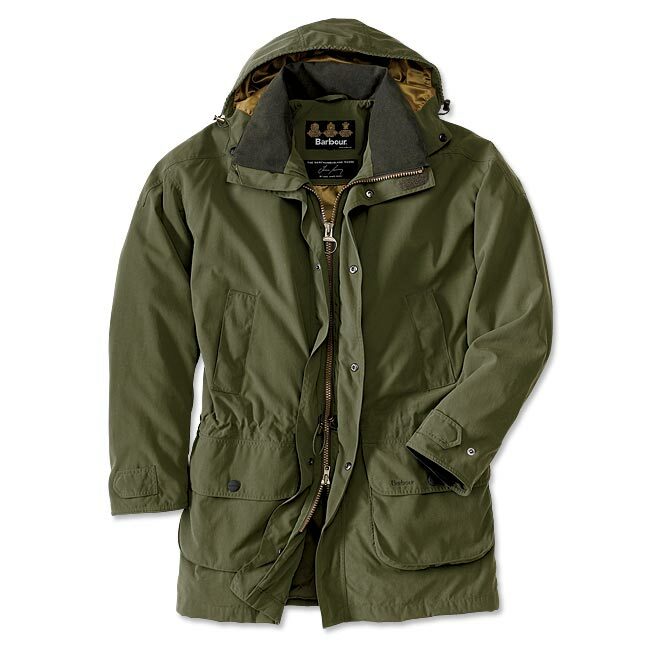 Kate’s jacket is another piece from Barbour, the Ladies Linhope style we’ve seen her wearing as far back as 2009. Below we show the men’s style. There are varying reports about Kate’s jeans, I do not know what brand they are. It’s possible they are new maternity style jeans like the J. Brand Maternity Skinny Jeans, the Paige Denim Maternity Skinny Jeans or others. 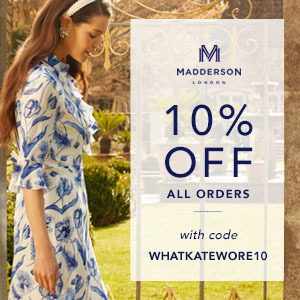 It’s also possible the Duchess is wearing an existing pair with an extender. Two items we hadn’t seen previously, Kate’s hat and fingerless gloves. The gloves remain unidentified, while Really Wild Clothing Company has verified the hat is their Lindsey style. We show it in the company’s ‘Ivy Dogtooth Tweed’ fabric, and it will be restocked at some point. Kate’s was ‘Tweed Moss Fleck’ and it will not be restocked. 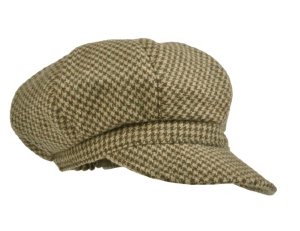 Many refer to this as a Baker Boy style, similar to a newsboy style cap but with more volume above the crown. It is rather difficult to see the cap under the snow and ice, the gloves do show up a little better in this photo. 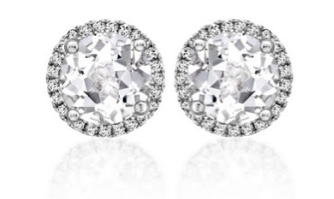 Kate also wore her Kiki McDonough Grace earrings. 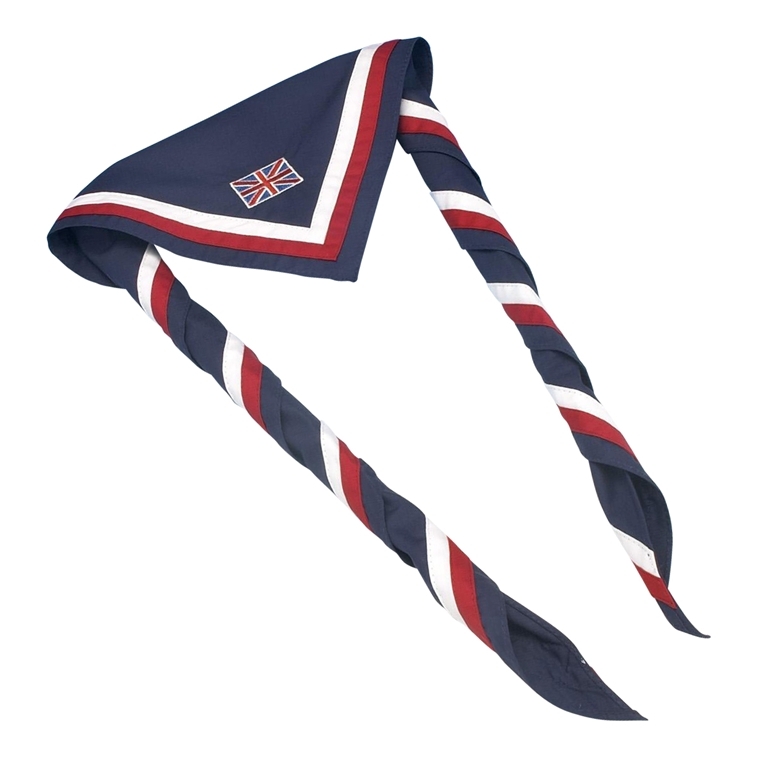 And she was sporting a UK Scouting neckerchief, or Scarf. It is for adult volunteers, selling at £8.50, roughly $13 at today’s exchange rates. The Scouts remind us all proceeds from sales of items like this scarf go right back into Scouting programs, obviously a good cause. It is always a delight to see people relishing the task at hand regardless of their surroundings or inclement conditions; this seemed the case with Kate, the Scouts and volunteers. 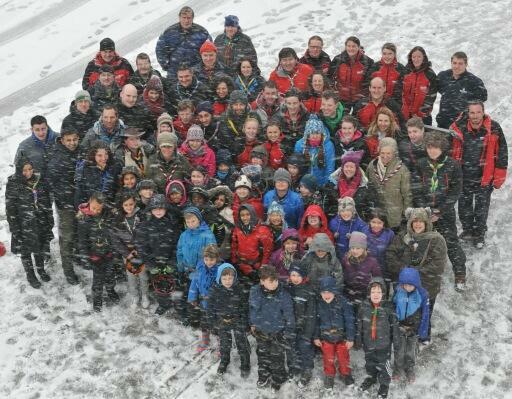 Our thanks to Simon Carter with UK Scouting and others for sharing information and photos today. Totally loving this look and how happy she seems! I love when Kate goes camping! She really does like the outdoors. I can’t believe she doesn’t even look pregnant in that coat at all. I do like her fingerless gloves! Is Kate the one in the middle of the back row in that old picture? That hat is ADORABLE. I don’t know when I would wear it but now it feels like I need one. I respectfully disagree on Kate’s location in pictture. I believe she is in the front left, right behind the children. She is wearing her hat. Look at the scarf colour for to verify. The girl with dark hair in the back middle is wearing a different coloured scarf. The photo we’re talking about is the old one of the Duchess as a child, with other girls her age then. It’s the second photo down from the top. Fingerless gloves on a freezing winter day? Hmmm? BUT – when one has the world’s most famous engagement ring on your finger, I guess it is understandable. For some reason I can’t figure out which girl is Kate in the old scout picture? Could someone help me out. Thanks!! Back row middle. The tall one. kate looks absolutely adorable in the hat. i’m glad she was protecting her hair in the snow–somehow her hair always looks so good! and the fingerless gloves are essential in cold weather when you still need to use your hands–practical and chic! Great post! Do you think it is possible the gloves are MInistry of Defence regular issue from her brother-in-law or husband? I Love EVERYTHING about this outfit – above all the symbolism!!? The whole “baker boy” look is so nostalgic and takes you right back to a more rural Britain – a more simple, natural way of (community) living with plenty of outdoor activities for the whole family, very much evident in many villages up and down the country (the heart of the nation) …It also has such strong resonance with austere times, when recession bites – being loving, warm, cheerful and supportive during such hard times. She is in her element here – At her best …What a gorgeous, lovely way to cap the whole week off!! Eh, I don’t know that I agree. If that’s her message, it’s lost on me because she’s also wearing extremely expensive jewelry. Anyone can buy a reasonably good copy of her Diana engagement ring in cubic zirconia for about $100. Sorry, but I have to agree with Beth. Somehow I don’t think the Duchess’s cap is a nostalgic comment on “rural Britain” or recession austerity. Nor do I think her ring or her earrings are cheap copies, Nancy Robertson. In fact, I have to wonder whether Iris is being sarcastically ironic. Ahhhh the UFO… gold ring! Any ideas? I love this outfit—including the hat—but I am a bit suprised she chose to wear the wellies in the snow. I know they are lined to be warm, but I find wellies to be less than sure-footed in the snow and ice. I think a pair of hiking boots might have been better for this occassion. As for the jeans, coat, hat, gloves and etc–LOVE it all. I’m not sure if those are fingerless gloves… Appears to me like a sweater with a thumb hole in the sleeve. I have a sweater that has that and looks similar. Any thoughts? she looks so happy and relaxed. lucky scouts! I agree! This reminds me of her past events where she gets to show off her personality – when she visited her primary school and during the Olympic events, for example. She seems she is the most comfortable when she’s in her element. She does a great job of meeting people at different charities, etc., but I think she’s really at home with the outdoors and sporting activities. Great article and I love that you hit the importance of the visit as well as the clothing :). Thanks! Agreed! – Excellent post ….Thanks, thanks, thanks, Admin! The last image has a better picture of the ring with the red stones than others we’ve seen. As I found out recently, it’s hard to tell if something is a garnet or a ruby unless you look at it under a microscope and see whether it radiates other colours. Great posting Susan! Sheâ€™s no wilting Duchess, is she? She gives every impression of being more than happy to muck in and looks so at home in casual gear. I notice you mention her wearing gloves, but they look more like wrist warmers to me, rather than fingerless gloves â€“ all the better for pushing up the sleeve to mix bread dough! Not that anyone can see much in the falling snow of course, although that does look like a clear shot of the ring on her right hand. I love the baker-boy peaked cap, the colour of the tweed really suits her, and of course, only a real Duchess would add the finishing touch of discreet bling in the earrings department. She looks wonderful, as always. I’m pretty much in love with this outfit…especially the hat. I’m digging that cap, wish I’d had one for the snowy winter were hopefully finishing up outside Boston! I find the fact that she wore her engagement ring and didn’t remove it to cook charming. As a former girl scout, I’m so happy to see scouting get some attention from the understated, hands on involvement of a high profile figure. Looks like a fun day! I found it interesting that the Duchess has been volunteering with a local troop – and that she has been able to do it without publicity. I believe that it shows that her choices as to where she will volunteer are very much personally driven – not dictated. Furthermore, that she takes said commitments seriously. One can see that she is very much at ease when out with children. It is good to see that she must be feeling very well as there are few pregnant women who having had sickness issues would spend time out in the cold and driving snow unless they were feeling very well. My main memory of cooking while on a scouting outing is producing spaghetti that stuck to the plate — quite tenaciously, in fact, even if you turned the plate upside down and shook it. Fortunately, my culinary skills have vastly improved since. That’s a very cute cap, but only the Duchess could get away with white topaz and diamond earrings in this context. Here we see her in flat heeled wellies, and I think it’s pretty clear that she is not 5’10” tall. shipped the boots REALLY fast! Very happy! She looks adorable & happy despite the weather. I lover her hat.